This past Thanksgiving, giddy media liberals parroted the fallacious conclusions of a Farleigh Dickinson University study. Daily Kos crowed: “New public study: Watching Fox News makes you dumber.” But it’s clear the poll was rigged merely to be smear fodder against America’s most viewed news channel. The FDU researchers titled their press release “Some News Leaves People Knowing Less.” In their misleading parlance, a news source (mostly Fox) “leads,” “leaves,” and “makes” the study participant dumber or less knowledgeable. The language gives the impression that some active force shapes news consumers’ responses. From this, one might conclude that Sean Hannity and Megyn Kelly emit brain cell-killing radiation when they appear on screen. But this is not some lab rat experiment with tightly-controlled variables. The researchers stacked the deck against Fox from the onset. Consider how the study collects data from its telephone respondents. If one receives any news information from a given source over the past week, his responses count in favor of or against that source. Now Fox News is a 24/7 telvision operation. Any channel-surfing couch potato can tune into five minutes of “Fox and Friends” and per the pollster instructions report they got some news from Fox. Meanwhile, NPR’s reporting, restricted to the commute hours and the less accessable radio format, is shield against association with casual news consumers. Such people might even tune in during jazz hour and correctly report they had received no news from NPR. On top of this selection bias, the FDU researchers share a liberal outlook with their favored media outlets. As can be seen from the wording in poll question two, they place a premium on foreign news over domestic happenings. 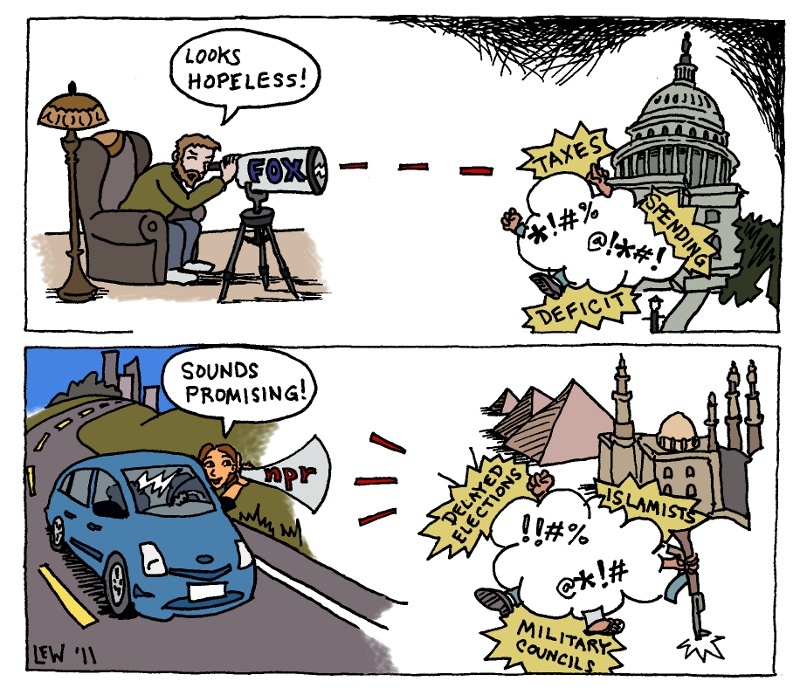 Mainstream media like TIME and NPR devote inordinate amounts of time fawning over the “Arab Spring,” but conservative-friendly media like Fox tend to dispense with the rose-colored glasses. Their viewers, having a vague awareness of continuing Egyptian upheaval, are not marinated in the feel-good pieces that liberal journalists keep producing. This disadvantage magnifies when the pollsters fail to mention Mubarak by name in asking whether his regime was toppled. For all we know, they are asking about the military transitional council! Then, when the questions roll on to domestic news, the poll fumbles by asking who is the Republican front runner. This is an especially murky proposition given the fluid nature of the field. The results vary depending on when and by who the poll was taken. All told, FDU stacked the deck against Fox, and packaged their study results a little too neatly for Kos, Arianna, and the rest of their progressive news friends.